When KK read me the email, it truly felt like someone had punched me in the stomach. For a couple of days, we both floated in a bubble of denial, hoping our contact in the US would reply to our list of frantic questions with a solution. It never came. The news was not what we were expecting to hear. They have decided to restructure and stop the international distribution model. Basically, our supplier will not be supplying us with anymore stock and advised us to close down the CW-X SA business. Gutted. Angry. Relief. Disbelief. Hurt. The timing was bitter sweet. After spending so many months getting our business up & running, we had just engaged in negotiations with a few partners to start advertising in top notch media. After a great evening hosting a stand at the Valentine’s Day Night race at Harriers, we had made plans with a few other clubs to sell our goods. Business had picked up! The tingling excitement when my phone beeped signaling a new order had come in never grew old! Now we are sitting with the dilemma of swapping our growth strategy for an exit strategy. It’s the weirdest thing. I’ve ping-ponged between feelings of complete sadness to days when I look back and at how much KK and I were able to accomplish in the last couple of months. The purchasing process, registering our company, opening up bank accounts, setting up the website, learning about the product, selling to customers, the late nights of prepping social media posts and running campaigns on Facebook & Instagram. Every day I felt more alive than ever! KK and I learnt so much about ourselves and one another too. Want to know how strong your marriage is? Run a small business part-time with your spouse! We’ve grown tremendously during this journey together. The pic is dark but it was a selfie we took the evening we had finally signed offer & loaded the car with stock. We were entrepreneurs! The first delivery! After being held up at customs for 5 weeks, this was one of the highlights! Unpacking boxes of our very first order of stock! The Sunday afternoons practicing setting up the banners and gazebo in our garden. We can’t thank our family & friends enough for the support during the last couple of months. You have been part of the success and the fun. The excitement you showed, the stories you listened to, believing in our vision. It has meant so much! Thanks especially to all our brand ambassadors and loyal CW-X fans: Dan, Kirsty, Gwynn, Timaya, Advocate Karen, Julia and Zara, Carl, Isabel, Jonty and Portia. It was a hell of a ride! So where to from here? A huge clearance sale of the stock we purchased. Updating the site to reflect the sale prices and trying to get back as much of our investment as possible. The learnings continue and I suspect it’s preparing us for our next business venture. As readers who follow my blog, you’re the first to hear the news before we send out official comms to our customer database. The good news is that you’re also the first to take advantage of the sale prices. Head over to the site to grab first dibs on the most amazing running clothes you will soon not be able to get locally before we shut down the site. I knew how much I hated running cross country so the thought of waking up on a Saturday morning to run parkrun did not appeal to me at all. When all my running friends were clocking up parkrun milestones, I kept a low profile. But it was the incessant nagging from another Running Junkie, Francis, which I simply could not ignore any longer and decided I’d run my first parkrun, but also to celebrate her 50th one. And did I enjoy myself? Will I be back? 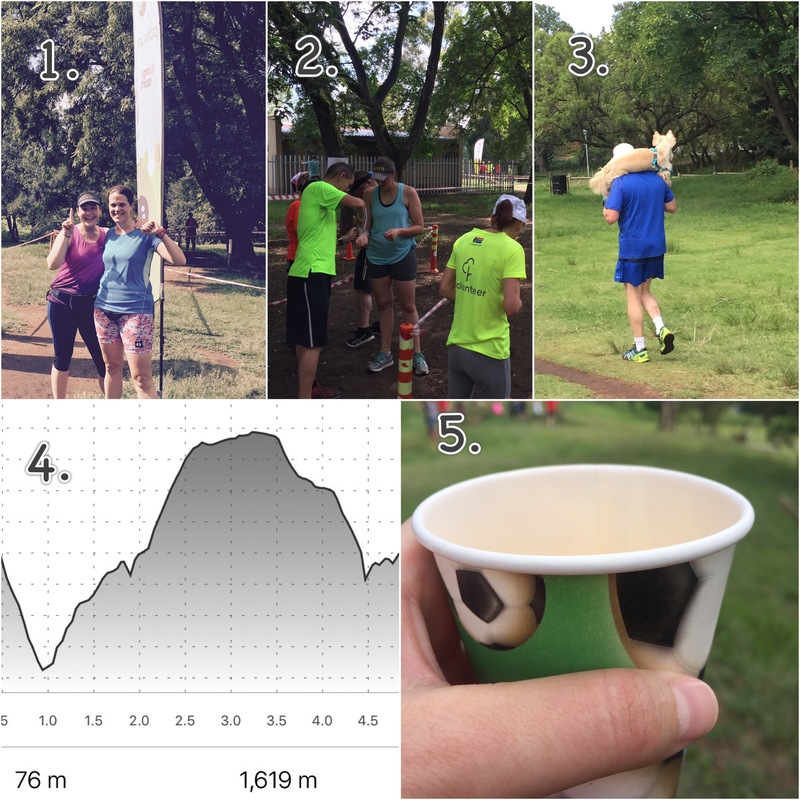 In thinking of answers to these questions some things stood out for me from my parkrun experience. 1. Don’t knock it ’till you try it: It wasn’t fair of me to have made up my mind about parkrun without ever having run one. Often what stops us from doing something is a preconceived idea which prevents us from giving things a chance. I’m going to take more chances in 2017 and be braver. 2. 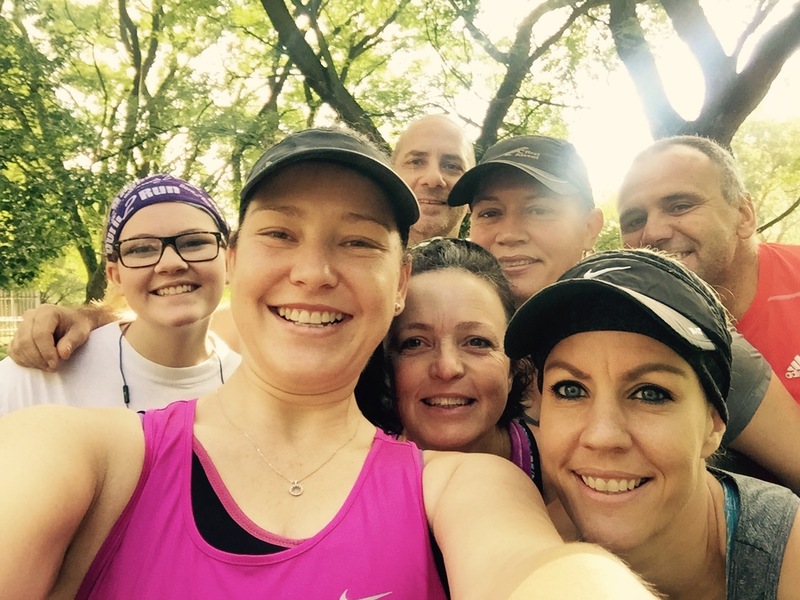 There’s always admin: If I must be honest, the whole barcode story of parkrun irritates me. With everything online nowadays, I wish parkrun had an app that would sync automatically with the likes of Strava, Garmin, Nike+ etc. to record your runs. But I guess in life, not everything is that easy. There are and will always be bloody admin; the stuff we all hate to do. Just do it! 3. Allow people to carry you when the going gets tough: A man ran to the finish line carrying his dog on his shoulders. Classic move! In chatting to him afterwards, he said the little guy got to 1km and was tired and couldn’t go on anymore. I don’t ask for help as often as I should. I carry around my stress and anxiety and don’t allow myself to acknowledge that some days, I need help. I know that I am surrounded by the most amazing family & friends who will gladly, and without hesitation, lift me up on their shoulders and carry me. Figuratively, of course! Don’t panic loved ones! 4. Push through the uphill struggles because the downhills come. Eventually: Delta Park parkrun starts with a crazy uphill but as you reach 3kms, it’s all downhill to the end. 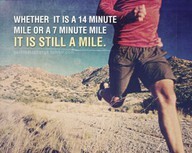 I kept hearing Coach Dave tell me this as we ran. I didn’t believe him, but when that downhill arrived, man it was glorious and I picked up my pace. When the going gets tough, be patient, the downhills will come Bron. 5. Make time to celebrate: To celebrate her 50th parkrun, Francis arrived with bottles of bubbly and cake. Dressed in her well-deserved red 50th parkrun t-shirt, it reminded me that we don’t take time to celebrate our successes anymore in life. We don’t stop to acknowledge what we’ve accomplished and we don’t reward ourselves for the hard work we put in. We need to do more of that! And we need to celebrate with our family & friends more often! Here’s to an amazing 2017 year ahead, and yes, more parkruns! There are three races that I ran in 2015 which taught me incredibly valuable lessons which I’ll be using as a guide in 2016. I had never run further than 21kms and this distance frightened me! I had sleepless nights worrying that I’d fail. In the weeks leading up to the race, it consumed my thoughts. But I did it! And loved it! I experienced moments of pleasure as well as extreme doubt & pain on the day. There were blisters. But wow, I floated on air pretty much for days after the race. I also learnt that in life, the journey is not always easy and there will be uphills. But each & every step will get me to that finish line! 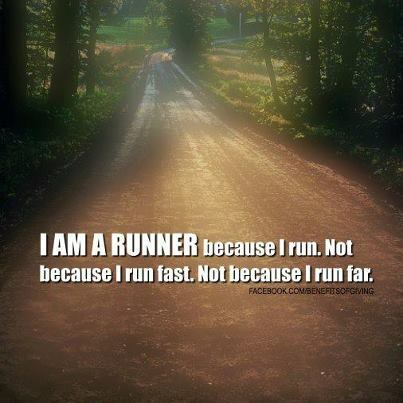 It’s the rule of running. I had heard the stories that this race was easy, flat (downhill) and a piece of cake. In fact most people spoke of PB’s. I believed them and repeated their stories with confidence. But on race day, my experience was different. The race was tough. The weather was unbearably hot. The camber of the road was painful and I did not manage to shave off the time I had expected to. In every situation, everyone has a unique story to tell. What’s mine? If you’ve followed my blog then you’d know that Two Oceans and I have not had the easiest of relationships. In fact I’ve hated the race since I missed cutoff a few years back. But last year I ran the race with my Dad. We ran together the entire way and as the light drizzle came down and we chatted and laughed at stories along the way, my fear and anxiety of the race disappeared. I didn’t care what my pace was or what my finish time would be. Nothing could take away that special moment. Realize that the reward is not the medal. It’s the family & friends in my life that run my journey with me each & every day!